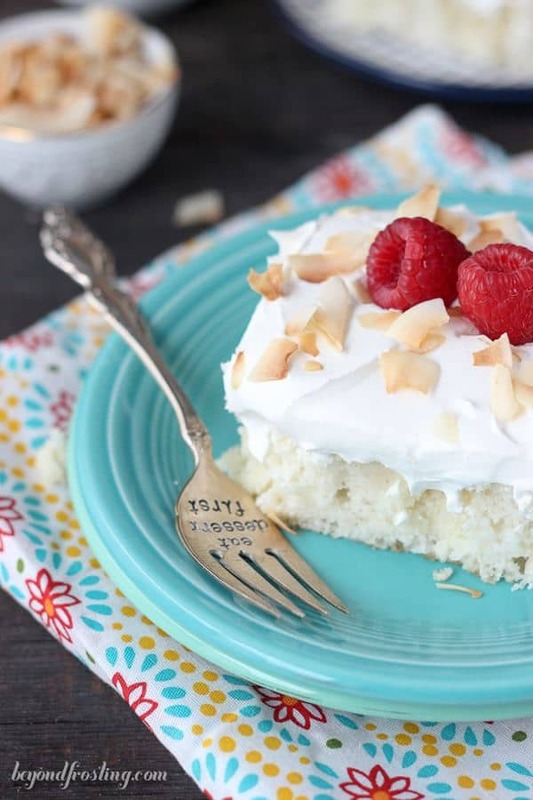 This Skinny Coconut Cream Poke Cake is a healthier coconut cake soaked in fat-free sweetened condensed milk and topped with a fat-free whipped topping. 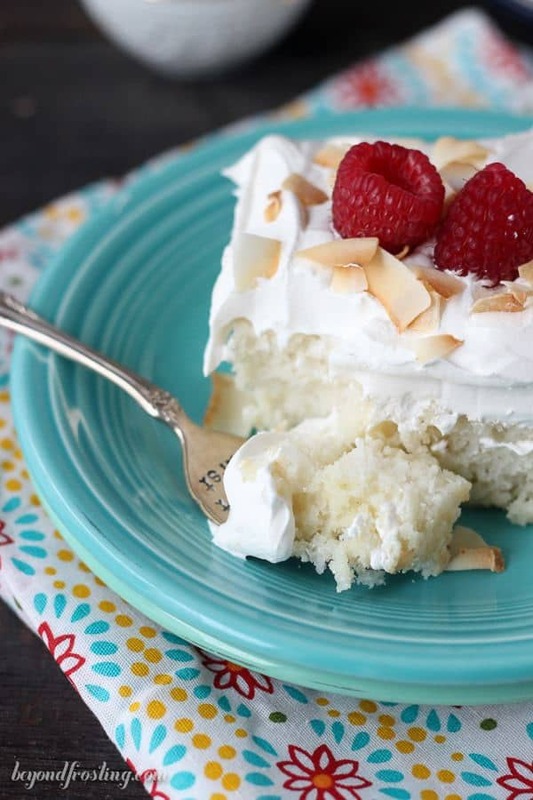 It’s your favorite coconut cake but without all the calories. Remember that time that Portland was blanketed with 8-12 inches of snow? It pretty unheard of for this area, but I have to say I am loving it! I missed a majority of the storm because I was traveling back from the east coast, but I flew home the next day in time to dig out my car and take in the beauty of the city covered in snow. Work has been closed for two days now and it’s supposed to stay frozen through the weekend. The only downfall is that it has really crippled the city. They really depend on the warm temperatures and rain to help melt the snow, but when that doesn’t come for several days, there is nothing else they can do. So what do I do when I am trapped inside? Bake! Cake is acceptable for breakfast, right? I hope so because this is what I ate for breakfast last Saturday as I prepared for my trip. I think this is definitely acceptable because this cake is skinnier than most. I know you are all trying to watch what you’re eating right now. 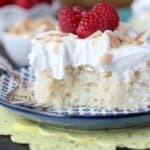 This cake is similar to my Triple Coconut Poke Cake but I’ve specifically chosen to use different ingredients to make it a little healthier than the alternative. It starts with a cake mix, and then I used egg whites, coconut Greek yogurt and diet 7up. It’s also filled with shredded coconut. If you make this cake even skinnier, you can use a sugar-free cake mix. In place of the diet 7up you could use even use coconut water or seltzer water. I prefer the carbonated drinks because it helps add a little air into the cake. I opt for diet soda to eliminate the sugar and extra calories, but I understand that diet soda isn’t the healthiest ingredients. I never said this dessert was healthy, it’s just a less calories option. You see where I am going here? Once it’s baked, you poke holes all over the top and pour a can of fat-free sweetened condensed milk. This helps keep the cake nice and moist. This cake is served cold, so the milk soaks nicely into the cake and then adds that element of surprise that no one is expecting. 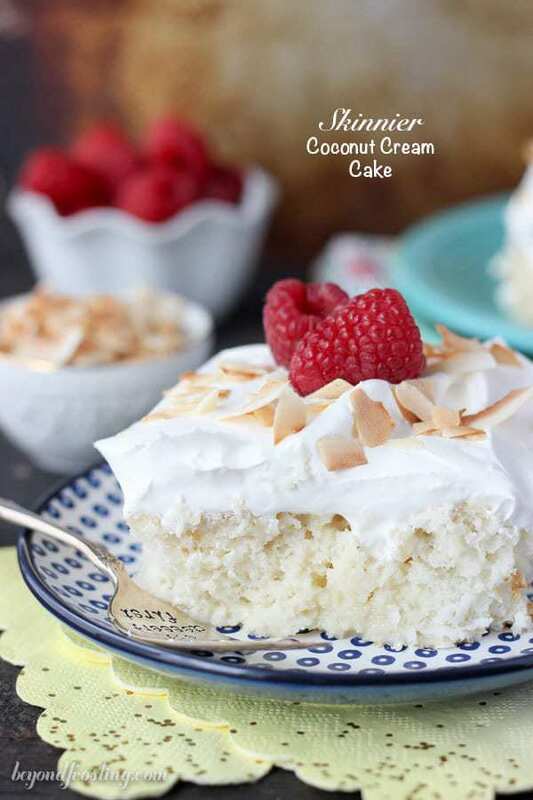 To finish off the cake, I grabbed a fat-free Cool Whip and some toasted coconut. I don’t have a healthy alternative to Cool Whip unless you wanted to use a coconut whipped cream but that can be hard to find. 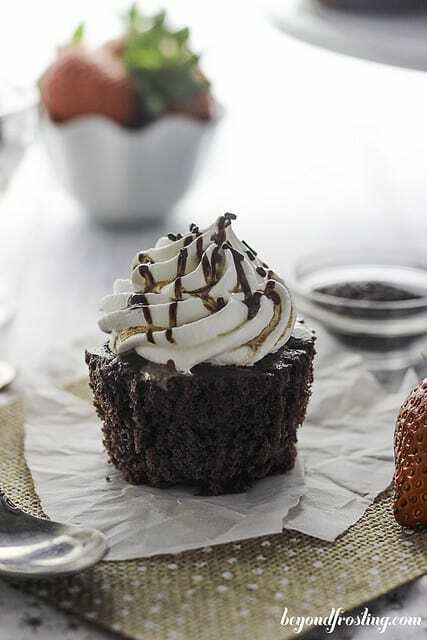 I guess you could always make your own, but that takes some planning because you get to get the cream very cold before you whip it. This is one cake that I just couldn’t put down. I always feel like I need to tell you guys how much I hated coconut when I was growing up, but just how much I love it now. 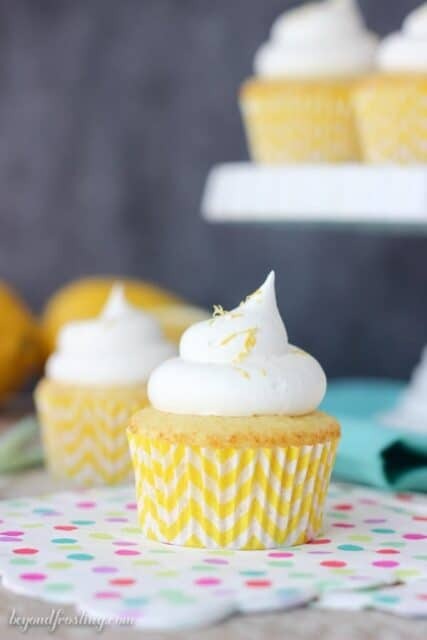 It one of my favorite desserts flavors to make and one that I need to immediately give away because I fear I will eat it all! For the cake: Preheat the oven to 350°F. Lightly grease a 9-inch by 13-inch pan. 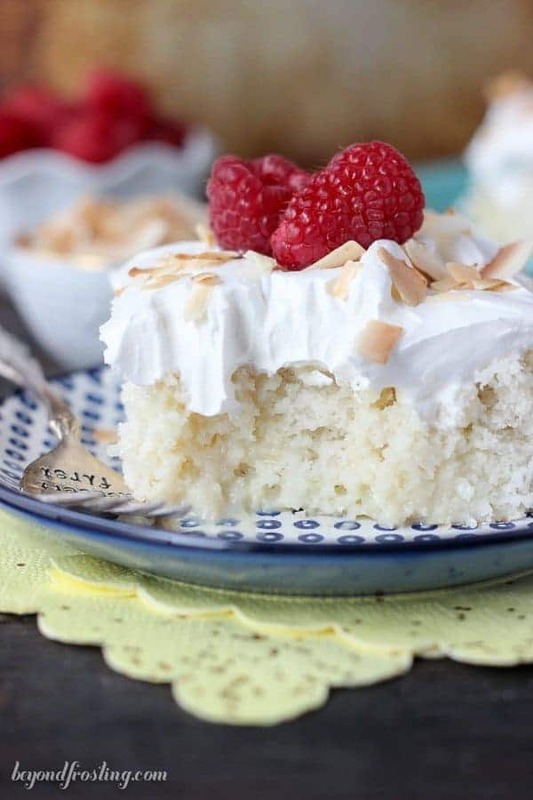 In a large mixing bowl, combine the white cake mix, diet 7up, egg whites, Greek yogurt and coconut extract. Beat all the ingredients until well combined. Lastly fold in the coconut. Pour the batter into the prepared pan and bake at 350°F for 18-22 minutes. To check the cake for doneness, stick a toothpick into the center of the cake. If your toothpick comes out clean, then your cake is done. Allow the cake to cool for 30 minutes. Before you turn off your oven, toast the coconut for the topping for 5-10 minutes until the coconut turns lightly brown. For the topping: Use a wooden spoon or small round object to poke holes all over the top of the cake. Pour the can of sweetened condensed milk over top of the cake, trying to spread evenly. Allow it to soak into the cake while the cake is cooling. Cool completely. Spread the Cool Whip over the cooled cake and garnish with the toasted coconut. This cake must be refrigerated after the Cool Whip has been added. Any idea on what the Points Plus would be? Or nutritional value? Thanks! Hi Rosemary, To figure this out, I would put the whole recipe into your weight watcher app and then divide it by the number of servings your intending to make. I would love a slice of this cake! 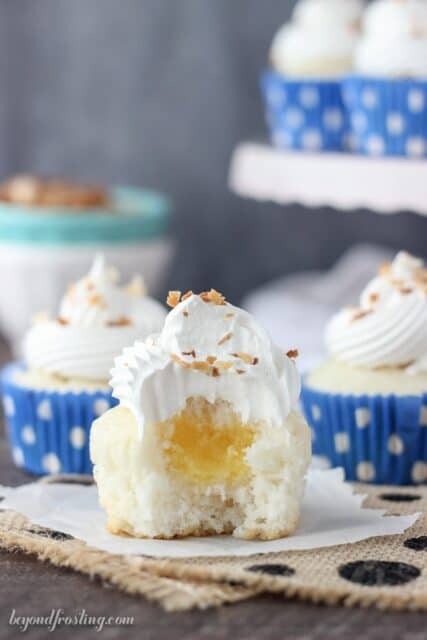 Coconut in desserts is so good! Yum deliumpcious! Looks wonderful. Snow Baking Day. Perfection (almost). I can think of a couple things that would make it perfect. KD and Shredding too.